In Wendy’s many bags she carted to our Antarctic environmental project with the Russian Antarctic Expedition were paintbrushes as well as cookbooks and kitchen items. She was resident artist and indispensable cook. Regretfully, Wendy didn’t have a lot of free time to pursue art but our forthcoming book, The Antarctic Book of Cooking and Cleaning, includes her journal excerpts in which she documents what she was able to create with found objects and notes the ideas that brewed and shaped her future work (such as her Antarctic Chronicles). Wendy didn’t paint with vodka in the Antarctic but we drank it and our book features a home-made Russian vodka recipe. Antarctica is the place for adaptation, innovation and learning from past Antarcticans and from nature. 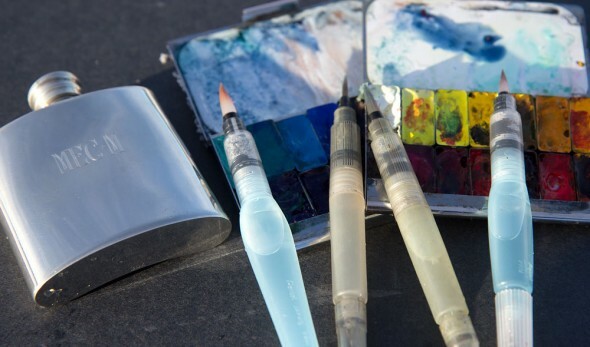 Which brings us to innovating and painting with vodka. A young America artist, Maria Corvell-Martin, learned from early Antarctic artist Edward Wilson about this cold-weather tip. She is a self-described Expeditionary Artist. 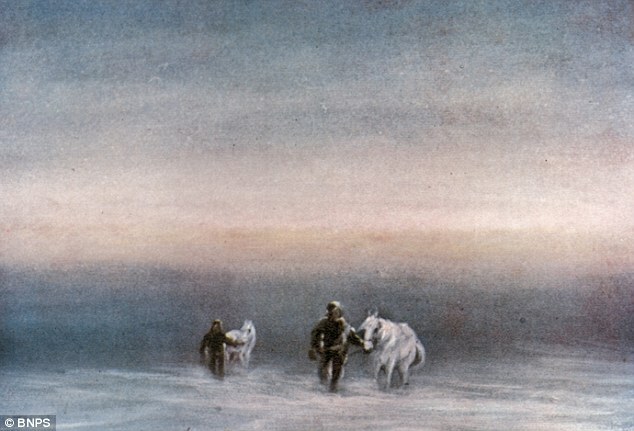 Maria’s major painting project in the Antarctic led her to a discovery. We love to meet people also investigating and creating in the art-science realm. 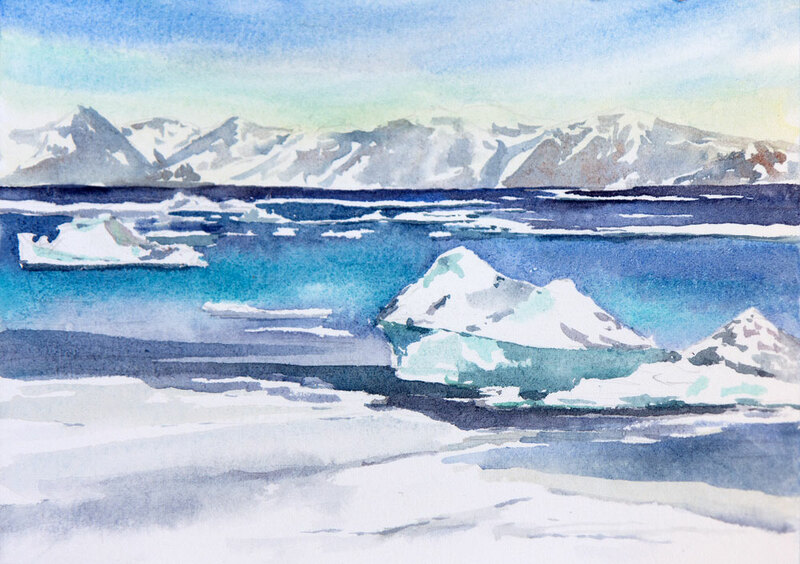 Also check out her newer project, Imagining the Arctic where she also uses vodka in Greenland to paint. 5" x 5" number sixteen: Red Tern. Maria Coryell-Martin. 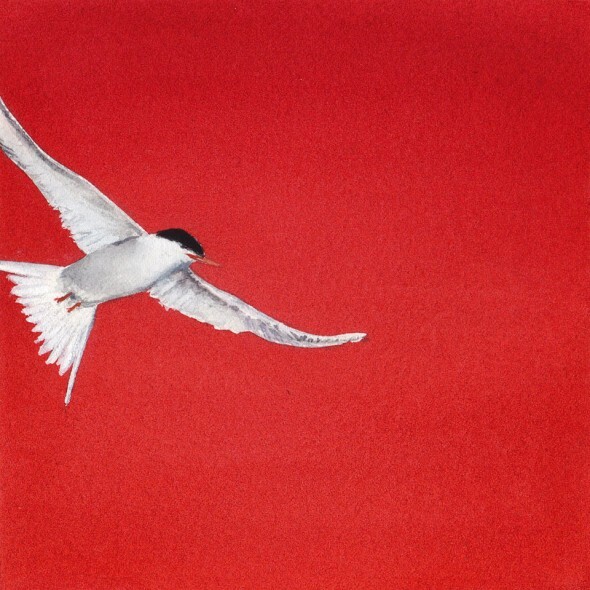 Arctic Terns migrate to Antarctica! Maybe you know that Antarctic is preserved, for now, as a continent important to the common heritage of humanity. Antarctica holds the vast majority of the world’s fresh water and ice. It was in this spirit of international cooperation that Wendy Trusler, The VIEW Foundation, the volunteers and I went to Antarctica to collaborate with the Russian Antarctic Expedition to help clean up Antarctica. 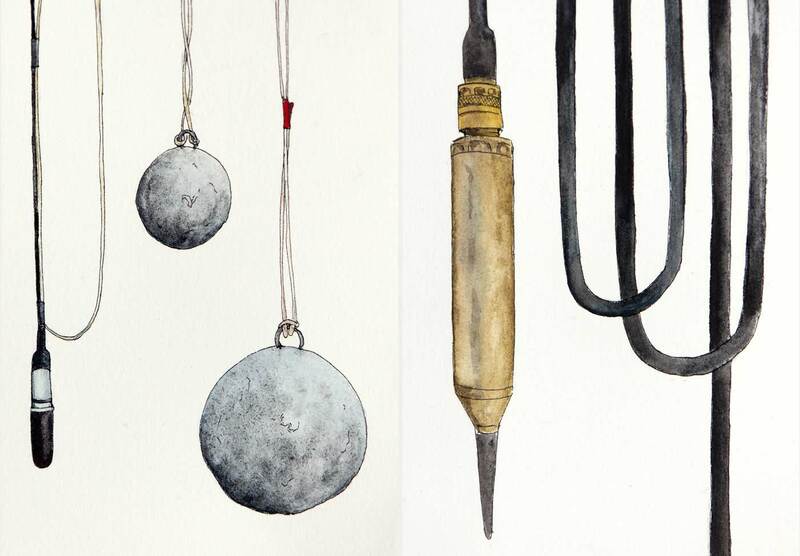 This work was a tiny but symbolic step and is the basis of The Antarctic Book of Cooking and Cleaning. How about seeds, as part of common heritage of humanity? Near the opposite pole, in the Arctic is this amazing significant place and another beacon of global cooperation. 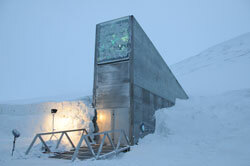 A global seed vault, up there in Svalbard, on a Norwegian island. First I found this image and thought, what the heck is this building popping out of the snow? It’s a cooler thing than I could imagine. Photo: Mari Tefre/Svalbard Global Seed Vault 26.02.2008. 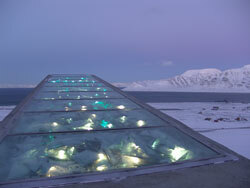 “The history of Svalbard Global Seed Vault starts as early as 1983. In common with other big projects, it’s been a long and not very easy journey. Preserving seed from food plants is an absolutely essential part of the work of preserving the world’s biodiversity, adapting to climate change and global warming and thereby ensuring food for the world’s population for the foreseeable future. There are hundreds of gene banks around the world. But some of them are vulnerable to natural disasters, war or the lack of management or finance. The foundation of a global ”central bank” for the world’s seeds (primarily of food plants) has therefore long been an issue. The first initiative for the creation of a safety deposit for seeds in permafrost was taken by the Nordic Genetic Resource Centre (NBG) as early as the early 80s. Svalbard, along with Greenland and the Jotunheim mountains, was assessed as a possible location at an early date. 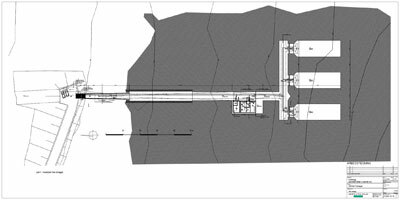 NBG visited Svalbard in 1983 and it was eventually decided to store seeds 300 metres inside a disused mine, mine 3, near Longyearbyen, where there was a permafrost of minus 3-4 degrees. Who owns the worlds heritage? In the early 90s there was heated debate between the various member countries of the FAO about patenting and access to genetic resources. Developing countries wished to receive part of the proceeds from the commercial seed industry, since the diversity mainly came from their areas, whilst the commercial seed industry wanted free access to such resources and the opportunity to patent the seeds. This led to a polarised atmosphere with little mutual trust regarding the administration of seed. The lack of international agreements to regulate this area eventually became an obstacle … Together with the Norwegian authorities they decided to shelve the plans for an international safety deposit for seeds in Svalbard. We have so much more to collaborate on globally, including food insecurity, but positive stories inspire.